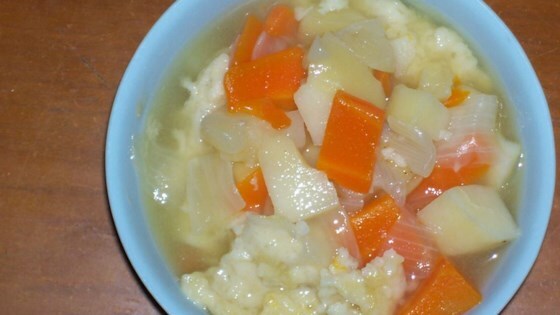 "These homemade family recipe dumplings are wonderful in any type of soup, chicken or otherwise. Grandma made the best. She never measured anything until one day a long time ago, I measured everything as she did it." Place the milk and salt in a saucepan, and set over medium heat. In a small bowl, mix together 1 1/2 tablespoons of flour and water. When the milk begins to bubble, stir in the flour mixture, and cook stirring constantly until thickened, 2 or 3 minutes. Let cool until set. You can put the mixture in the refrigerator to speed the process. Fold the eggs into the chilled dough. Add 1 cup of flour and mix thoroughly (dough will be lumpy). Drop into simmering soups by the teaspoonful. Simmer covered for 10 minutes, remove lid, and simmer 10 minutes more. These traditional dumplings are boiled then fried in butter. what is the last cup of flour on the recipe used for? These were not good at all. My family wouldn't even eat them and I thought my husband would eat anything! Maybe to many eggs? I am German, actually born in Germany, and I never heard of dumplings made this way. They weren't very good either. These are wonderful dumplings. I followed the recipe exactly making no changes. I make these for my husband who loves dumplings. They are good with soups and stews. I am giving this a four stars for texture,which was very good and light, however I am questioning why the flour measure for the cup is listed twice? I did not need the second measure of flour.